Market analysts predicted a record number of hogs to appear in the June USDA Quarterly Hogs and Pigs report, and the final tally did not deviate far from pre-report estimates. As of June 1, there were 71.7 million hogs and pigs on U.S. farms, up 3% from June 2016 and the second largest inventory on record ever. It is clear the U.S. pork industry is in growth mode. It is no longer a question if America’s pig farmers are expanding or not. “All we are talking about is the magnitude and rate of growth. We are all settling into the growth mode. It is simply a question of how fast,” stresses Joseph Kerns, president at Kerns & Associates. Despite the record production year for 2017, hog prices currently are decent. Lee Schulz, Iowa State University Extension livestock economist, says swine profitability turned the corner in June to the positive side with an anticipated annual average of $15 per head for the year. Overall, the economic picture for the U.S. hog farmer is brighter than expected and will most likely fuel producers to expand the breeding herd. However, the growth of the breeding herd numbers is modest at 6.07 million head, up only slightly from the previous quarter and an increase of 2% from the same quarter in 2016. Scott Brown, University of Missouri assistant Extension professor, says the breeding herd numbers show stability in the industry. The breeding herd is still growing but easier to predict as pre-report estimates align with the USDA report. The only exception is the March-May farrowing intentions, which penciled higher than market watchers’ forecasts (refer to the chart below). “Given better economics than many of us thought when we started 2017, I would not have been surprised to see a little larger breeding herd, in the report today, than we end up with,” notes Brown. Kerns explains it is not economics that are driving the expansion but the ability to execute the expansion. For those hog farmers involved in the new processing plant, they are dead set on expanding. In other states, permitting issues and construction resources inhibit rapid expansion to occur. It can’t happen overnight. Looking deeper into the sow numbers, variation occurs across the states. For instance, Iowa added 30,000 sows this quarter. This is reasonable as the new Seaboard-Triumph plant is soon to come online in the area this fall. On the other hand, the sow numbers declined in the region — Illinois and Indiana — most likely to send hogs to the new Coldwater, Mich., plant. The growth of the sow herd will continue to climb. U.S. pig farmers added 90,000 sows to the herd in 2016, which easily fills the current packing capacity. Kerns expects hog farmers to add 100,000 sows per year for the next two years as more shackle space comes available. “In my opinion, we still have some upward pressure on expansion opportunities. I do not see anything that is providing a braking mechanism to slow sow expansion,” says Kerns. The optimistic nature of the U.S. swine business is driven by strong demand around the globe. Dermot Hayes, Iowa State University economist, calculates pork production climbed 3.4% so far this year while pork demand resulted in a net increase of 4%. The growth in pork demand is not domestically as it remains relatively flat in 2017. Exports account for the majority of the increase in pork demand for 2017. For this year, U.S. pork exports exceeded expectations and hold the key to the future of the industry. U.S. inventory of all hogs and pigs on June 1, 2017, was 71.7 million head. This was up 3% from June 1, 2016, and up 1% from March 1, 2017. This is the highest June 1 inventory of all hogs and pigs since estimates began in 1964. Breeding inventory, at 6.07 million head, was up 2% from last year, and up slightly from the previous quarter. Market hog inventory, at 65.6 million head, was up 4% from last year, and up 1% from last quarter. This is the highest June 1 market hog inventory since estimates began in 1964. The March-May 2017 pig crop, at 32.3 million head, was up 4% from 2016. This is the second largest March-May pig crop since estimates began in 1970. Sows farrowed during this period totaled 3.06 million head, up 3% from 2016. The sows farrowed during this quarter represented 50% of the breeding herd. The average pigs saved per litter was a record high 10.55 for the March-May period, compared to 10.48 last year. Pigs saved per litter by size of operation ranged from 7.70 for operations with 1-99 hogs and pigs to 10.60 for operations with more than 5,000 hogs and pigs. 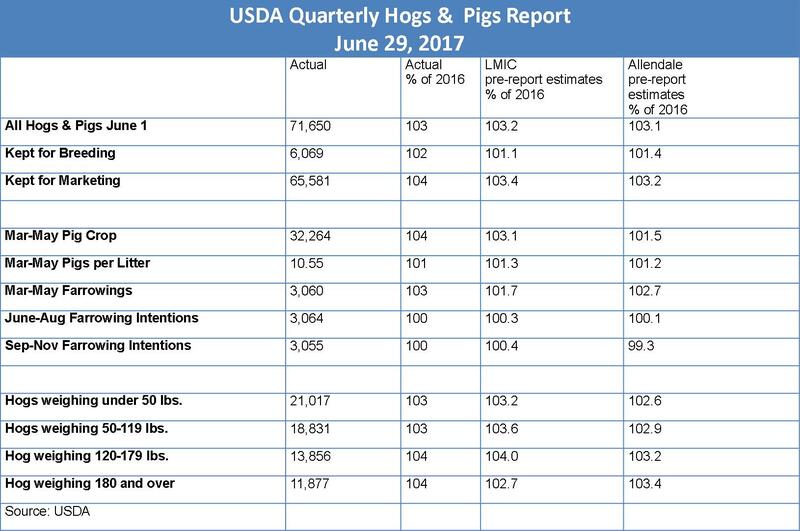 The entire USDA Quarterly Hogs & Pigs report can be found here.